which is the second highest summit in South America? The question of the second highest summit in the Andes has been long running. Many authorities, including, until quite recently, the offical Argentine authorities, award this honor to Monte Pissis, which is quoted at 6882m against 6864m to its nearby rival, Ojos del Salado. I'm just back from a successful trip to the Puna, four 6000m summits including both Pissis and Ojos del Salado with a number of clients. I took the following measurements with my GPS, both times I took several readings over 5-10 minutes, which were all in agreement (within a meter or so anyway). Taken with GPS in satellite rather than barometric mode. Ojos del Salado - 6905m, 27º06.589' 68º32.495' this was taken sitting right on the Argentine summit. The Chilean summit may or may not be about 50cm higher and is about 30-40m away to the West. The whole summit area was much steeper than I remembered (or was that just the hard work climbing at this altitude!!) and so this is probably compatible with your SRTM cell reading of 6868m. Pissis - 6788m, 27º45.328' 68º47.898' This was taken about 5-8m below and 20-30m SE of the summit due to intense electrical activity in the atmosphere, which would have made standing on the summit very unwise!! I'm now very convinced by both these data and the SRTM data that Pissis is just 6795m or so high. The error appears to be quite localised as GPS readings taken on the way there (20-30km from the mountain) were spot on with the Argentine spot heights. I am aware that other GPS readings reported from Pissis are higher, including the 1994 differential GPS survey reported by Argentina. However, even if these are right, I still maintain that Pissis is lower than Ojos del Salado. The official Argentine elevation of Ojos del Salado is 6864m. But this was not, as far as I can tell, derived from GPS, and it is at odds with the official Chilean elevation of 6893m. To support the GPS reading found by John Biggar, I have found other measurements. (i) Trekkingchile.com. This site supplies a summit GPS reading of 6918m. (ii) Berg Adventures International. From this site: "He was involved with some Austrians who did a survey here a few years ago, a GPS survey". ACONCAGUA Argentina 6962 meters; OJOS DEL SALADO Chile 6900 meters. 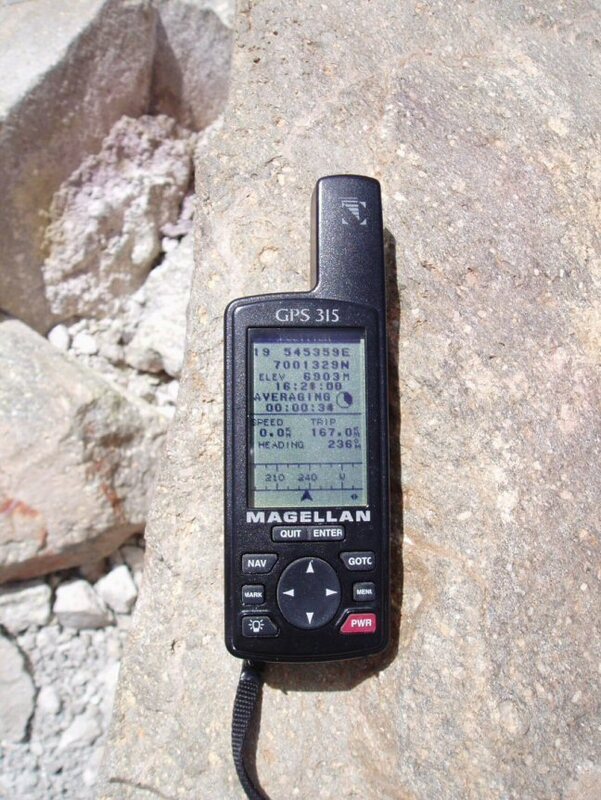 (iii) World Wide Vikings have an image of a Magellan GPS atop Ojos del Salado. From this 2004 image I read the following: "19 545359E 7001323N" [from which I compute -27:06:40 -68:32:32] "6903m". In 1989, using Global Positioning System (GPS) technology, Francesco Santon from the University of Padua in Italy surveyed both Aconcagua and Ojos del Salado with the help of his colleagues from Padua, the Argentine Institute of Glaciology and Nivology, and Argentine mountaineers. Ojos del Salado was determined to be 6 900 metres (22,637 ft) above the sea level, and Aconcagua was determined to be 6 962 metres (22,841 ft) above sea level, with a possible error of plus/minus five metres. These measurements convince me that Ojos del Salado is the second highest mountain in the Andes. POSTSCRIPT. Since the above article was posted, the following pages, which support the above conclusion, have been posted to "summitpost" by Janne Corax. Update May 2006. Details of an accurate DGPS reading from the summit of Monte Pissis by Peter Schön, further confirming the above, have been posted to http://www.mapping-gis.de/files/file/Technology&more012008English.pdf. Meanwhile a GPS reading by Bob Packard on Ojos del Salado has confirmed that it is close to 6900 m.